This coming week is going to be a busy one. You see, Passover is coming. Some Jewish holidays are easy affairs. Chanukah just requires a menorah, some candles, and perhaps a dreidel. Purim is a fun affair involving costumes, triangle-shaped cookies, and noise makers. However, Passover is anything but easy. There are many rules about what can and can’t be eaten during Passover and, of course, different people observe different things. For me, we essentially need to buy only products that are specially marked as Kosher for Passover (with the exception of fresh fruits and vegetables). 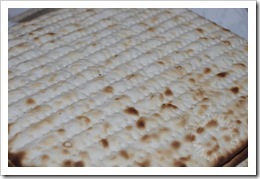 There is a general prohibition on any leavened product, so that means no bread. It also means all cookies, cake, tortillas, waffles, pancakes, cereal, etc. are forbidden. Of course, I don’t just take out the Passover food, cook it with our usual pots and pans and place it on our usual plates. Before Passover begins, I need to clean the kitchen and dining room to remove all crumbs. I need to put away all non-Passover pots, pans, plates and utensils and take out our Passover ones. I need to clean the fridge, oven, stove, sink, microwave, and dishwasher. (Luckily, that last one is pretty self-cleaning.) I also need to make room in the cabinets for Passover items. In short, there’s a lot of work to do and very little time to do it in. Thus, while I’ll try to post a few times this week, you’ll forgive me if I take a few days off. Rest assured that I’m not just slacking off. I’ll just be very busy getting ready for Passover.